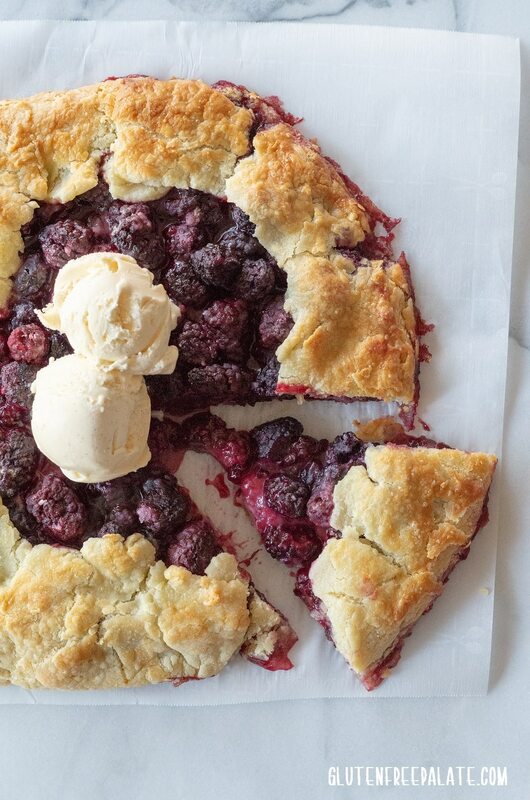 A simple Gluten-Free Rustic Blackberry Tart that highlights sweet blackberries and a buttery, flaky crust. 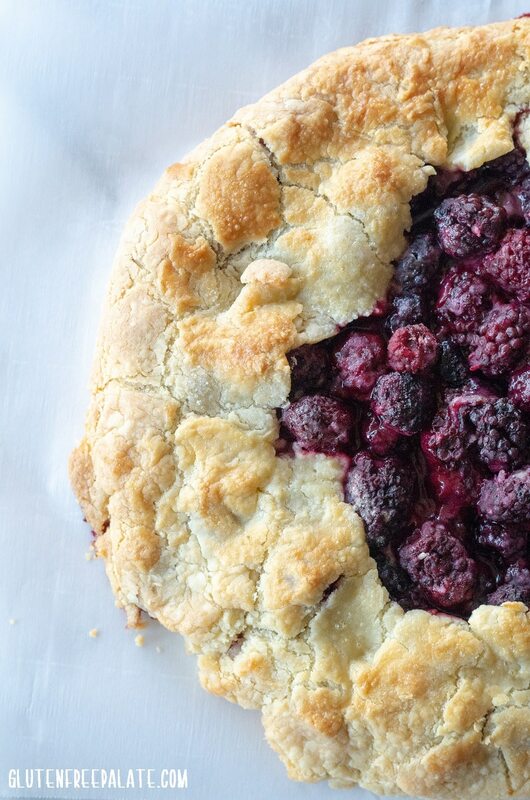 You are going to love this gluten-free blackberry tart. 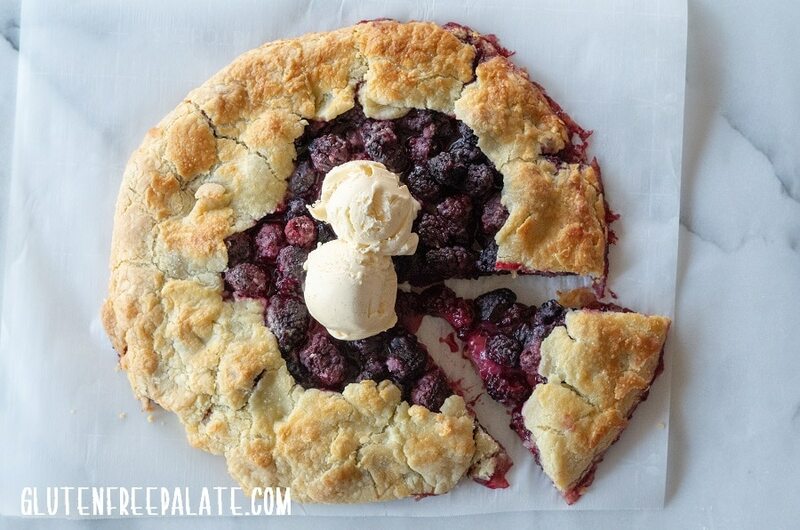 Every summer my family picks tons of blackberries and freezes them for fall baking. 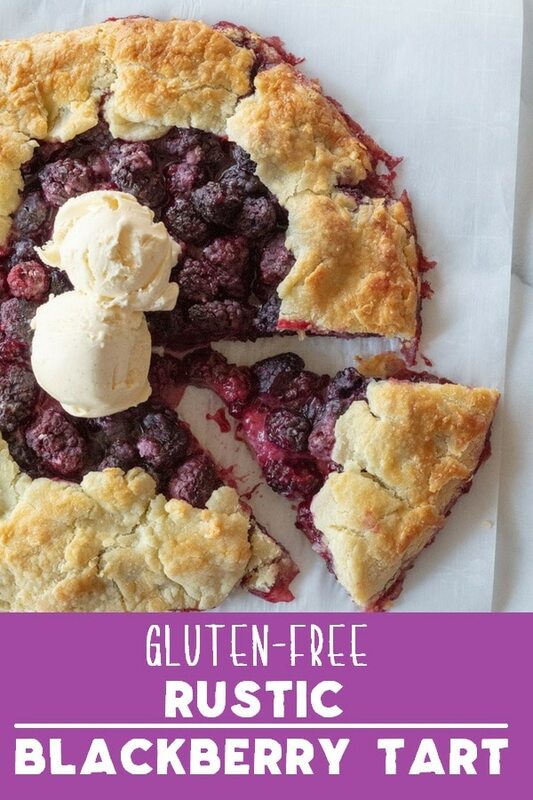 This gluten-free rustic blackberry tart has been a favorite for many years and I’m super happy to share the recipe and some tips with you. You can use almost any type of fruit with a regular gluten-free tart or gluten-free rustic tart. A regular gluten-free tart looks like a pie but it’s not as deep (and it doesn’t have as much filling). A rustic gluten-free tart is the same thing except you don’t bake it in a pie pan and you don’t have to worry about how it looks. Where a gluten-free rustic blackberry tart may not look as formed or pretty as a pie or a traditional gluten-free tart, they are still quite lovely and they don’t require as much work with the crust. Do I need to wash blackberries before I use them? If you picked wild blackberries, that you are sure weren’t sprayed with pesticides at any point, you could skip the washing but I would still wash them. You never know what kind of animal was hanging near those blackberry bushes. If you purchase blackberries from the store or super market ALWAYS wash them just in case they were sprayed or contaminated during handling or shipping. How do I freeze blackberries? When you want to prepare blackberries for the freezer you first need to rinse them under cold water then lay them to dry in a single layer on paper towels. Once they are dry you lay them in a single layer on a baking sheet and freeze them from 3-4 hours. Once they are frozen you can put them in a large zip-lock bag or storage container in the freezer. By spreading them in a single layer on a baking sheet before freezing you are freezing them individually and it will help prevent them from clustering together in the freezer. You can also use other fruits in this recipe. Cherries, apples, and peaches are a couple that compliment this gluten-free pie crust. Can I use frozen blackberries? You can use frozen blackberries just note that they will be a little softer after they cook up. When you freeze berries it changes the particles in the blackberries. The same thing happens with most fruits and vegetables. Where a fresh blackberry will be firm at room temperature a blackberry that’s been previously frozen will be soft and squishy. Can I use a pre-made gluten-free pie crust? You can, just note that most pre-made frozen crusts won’t be as big in diameter as the crust that’s in this recipe. Also, depending on the crust it may be a little difficult to work with. It’s up to you, if you have a favorite, pliable gluten-free pie crust then go for it. This recipe isn’t super difficult to make but the crust does take a little bit of work. 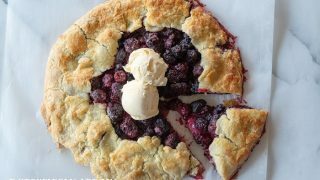 If you are in a pinch you can use your favorite gluten-free pie crust and just make the gluten-free rustic blackberry tart filling. Why doesn’t my gluten-free pie crust look like your pie crust? No two pie crusts are ever the same. You may have used different ingredients, or different brands of the same ingredient. Also, they way you rolled it out and pulled it all together may be different. If it tastes good then it doesn’t matter if it looks like my pie crust. Do I have to use the egg wash? Not at all! I don’t usually use an egg wash. The reason I did in this recipe is to give it a big of a glossy look and to help the crust flake a little around the edges. If you can’t have eggs you can use cream or just leave it off. If you like blackberry desserts you might also like my Gluten-Free Blackberry Cobbler, Grain-Free Blackberry Shortcakes, or Blackberry Breakfast Cake. All three recipes are simple to make, perfectly sweet, and satisfying. Looking for more gluten-free tarts? 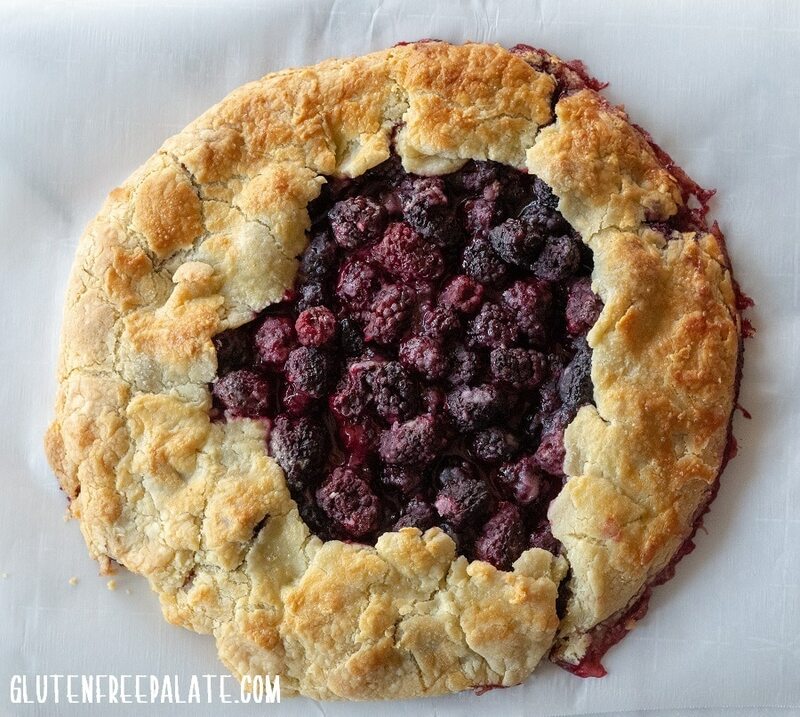 Sara Bakes Gluten Free has an incredible recipe for a gluten-free vegan rustic berry tart. Also this Gluten-Free Apple Pear Tart from My Gluten-Free Kitchen is quite lovely. Did you make this recipe? Please stop back by and let me know what you thought. I always love hearing from my readers. Also, if you have a questions please leave it in a comment below and I will get back to you. A simple Gluten-Free Rustic Blackberry Tart that highlights sweet blackberries and a buttery, flaky crust. Preheat oven to 425°F (220°C). In a medium mixing bowl, combine flour,salt, and xanthan gum. With a pastry knife (or a knife and fork), cut butter into flour until butter is the size of small peas. Add milk and combine. Add additional milk if needed. You may need to use your hands to work the milk into the dough. Dough should be moist and easy to roll. Roll dough out on a gluten-free floured surface with a rolling pin until approximately 10-inches in diameter. Alternatively, roll dough between two pieces of parchment paper. Transfer to a parchment paper lined baking sheet that has an edge that's at least 1/2" high. Having a baking sheet with an edge will prevent the juices from running into your oven and burning. In a large mixing bowl, combine blackberries, sugar, flour and lemon juice; spoon over pastry to within 2 -3 inches of edge to leave room for folding. Fold pie crust edge over the filling, leaving the center uncovered. Brush the folded part of the pie crust with beaten egg then sprinkle the edges with turbinado sugar. Bake 50-55 minutes or until crust is golden brown and filling is bubbly. Thank you for stopping by! Yes, you could use tapioca flour to thicken it. I was trying to make it as simple as possible, so I designed the recipe to use gf flour in the berry filling. Feel free to use your favorite thickening agent. I love blackberries! This tart looks fabulous and perfect with ice cream! Which brand of flour did you use in the filling?